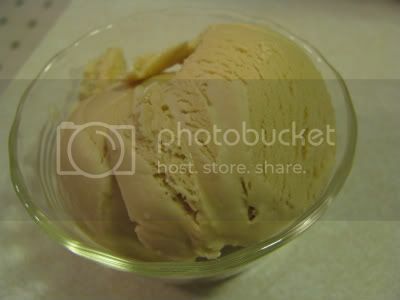 Last time I blogged about making ice cream, I was about to make coffee ice cream. I am so not a food stylist or photographer, but this is the way it turned out. We like the flavor, but the consistency was slightly icy. I'm not sure why, so we'll have to try it again to find out! 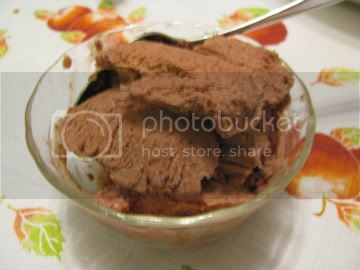 This week we also made chocolate frozen yogurt, using a recipe that came with the ice cream maker. The recipe calls for blending semisweet chocolate with milk, then adding vanilla yogurt and sugar. This is the first frozen dessert we've made that I really didn't care for. It's chocolatey, but with the tang of yogurt. (I wouldn't mind the tang if it was combined with a fruit flavor, but I don't like it with chocolate.) My son likes it, so it won't go to waste. And this isn't exactly health food: it may be low in fat, but it has a fair amount of sugar from the chocolate, yogurt, and, of course, sugar. Next up: strawberry ice cream! That Chocolate Frozen Yougurt looks yummy!